Sethu Institute of Technology, Kariapatti has advertised in THE HINDU newspaper for recruitment of Teaching Faculty- Professor / Associate Professor / Assistant Professor jobs vacancies. Interested and eligible job aspirants are requested to apply within 15 days from 18th July 2018. Check out further more details below. About College: The purpose of education is to make an individual a unique personality so as to help the society with the vistas of new ideas. 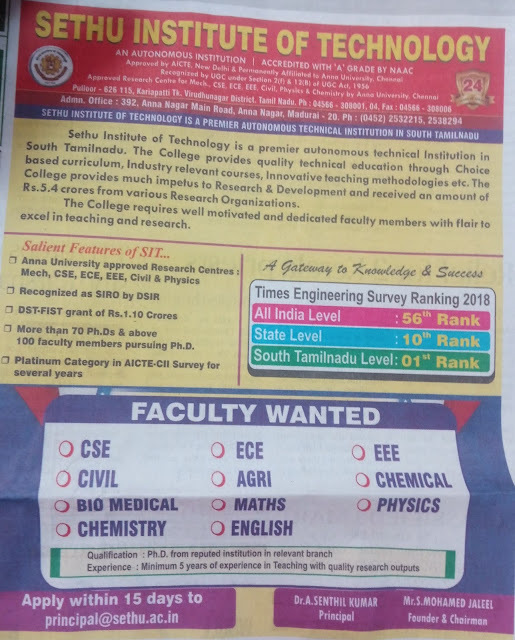 With this focus in mind and with the blessings of the Almighty, our zealous SETHU EDUCATIONAL TRUST established Sethu Institute of Technology in the year 1995 at Pulloor, Kariapatti – 626 106, Virudhunagar District with the motto of “KNOWLEDGE, SERVICE, PROGRESS”.Sethu Institute of Technology,the brainchild of our Founder & Chairman, Mr. S. Mohamed Jaleel, has been rendering its noble service since 1995 catering to the sustained growth of the educationally, industrially and economically backward rural areas. The college started with 180 students in the year 1995 with three UG Programmes has recorded a stupendous growth of expanding to the strength of 4013 students with 8 UG courses and 7 Post Graduate programmes.